What is the volume of a cone with a height of and a base with a radius of ? To find the volume of a cone we must use the equation . In this formula, is the area of the circular base of the cone, and is the height of the cone. We must first solve for the area of the base using . The equation for the area of a circle is . Using this, we can adjust our formula and plug in the value of our radius. Now we can plug in our given height, . Multiply everything out to solve for the volume. The volume of the cone is . What is the equation of a circle with a center of (5,15) and a radius of 7? The letters and represent the -value and -value of the center of the circle respectively. The equation with a center of (5,15) and a radius of 7 is . What is the volume of a cone that has a radius of 3 and a height of 4? where denotes the radius and denotes the height. 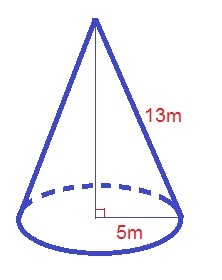 Find the volume of the following cone. 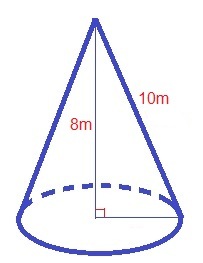 where is the radius of the cone and is the height of the cone. Find the volume of the following half cone. What is the volume of a right cone with a diameter of 6 cm and a height of 5 cm? The general formula is given by , where = radius and = height. The diameter is 6 cm, so the radius is 3 cm. 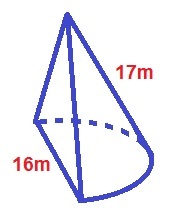 There is a large cone with a radius of 4 meters and height of 18 meters. You can fill the cone with water at a rate of 3 cubic meters every 25 seconds. How long will it take you to fill the cone? You have an empty cylinder with a base diameter of 6 and a height of 10 and you have a cone full of water with a base radius of 3 and a height of 10. If you empty the cone of water into the cylinder, how much volume is left empty in the cylinder?